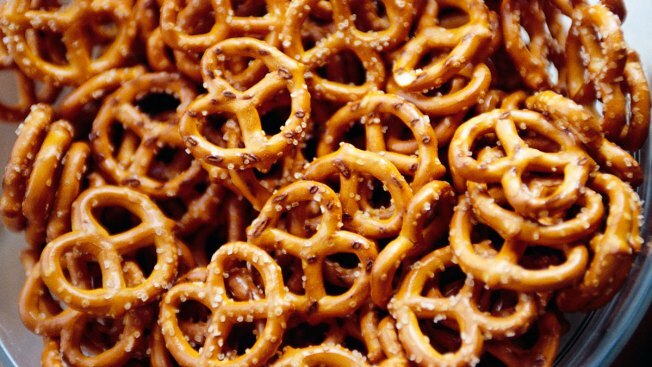 A bowl of pretzels is pictured in this file photo. Frito Lay is recalling Rold Gold pretzels that could contain peanuts not listed on the labels. Certain packages of Rold Gold Tiny Twists, Rold Gold Thins, Rold Gold Sticks and Rold Gold Honey Wheat Braided pretzels were made with flour containing peanut residue, according to the Food and Drug Administration. The affected products contain "guaranteed fresh" dates from June 28, 2016 through Aug. 23, 2016 and have the digits "32" in the second and third positions of a nine-digit manufacturing code on the label (ex. x32xxxxxx). They were sold around the country individually and in several multipack items, including Baked & Popped Mix, Sunchips & Rold Gold Mix, Fun Times Mix, Baked & Popped Variety Pack and Home Town Favorite Variety Pack. No illnesses have been reported. More information is available online or by calling 888-256-3090.